Credit Bubble Stocks: Petróleo Brasileiro S.A. If Prechter is right, 2009-present was just a bear market rally and the market will eventually take out the 2009 low. Notice that Petrobras has already traced that out perfectly. The beauty of PBR is that it is a Brazilian company not run for the benefit of its shareholders and so it has no fundamentals. The value is solely psychological. Check out this chart I just made showing the inflation adjusted DJIA going back 100 years. That chart has been severely beaten with the ugly stick. Yuck. Yep. It would surprise me if the S&P didn't follow the PBR down. I bought Prechter's Conquer the Crash book when I first became permabearish back in 2004. One thing that has not worked out in his favor is his advice to buy treasury bills. You'd think a guy planning for deflation would at least go out a ways on the yield curve. I did. No complaints! Treausury bill holders though? ZIRP has not been kind. That could easily change of course. It's all relative. If the stock market craters... well, you know. It's time to buy muni CEFs trading at a discount. My taxable account is stuffed to the gills with long CA munis right now (e.g. NKX). Discounts have narrowed slightly (~1%) over the last month or two, but still stand at very high levels (~10%). I considered buying long treasuries (TLT or ZROZ) but it seems like the potential upside for munis is comparable while the potential downside and volatility were smaller. Even if rates go sideways for a while munis are a good place to be. 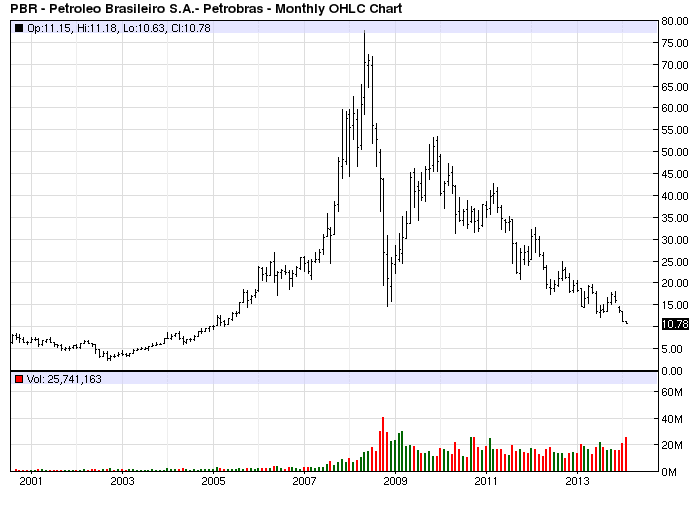 I view the chart of PBR as a proxy for a the state of investor confidence in the Brazilian govt. From the peak of infatuation with Brazil as one of the bright shiny BRICs to the current state of disillusion. At the end of the day PBR is a piggy bank for a tiny kleptocratic elite that feels no sense of kinship or duty to the great mass of low IQ Brazilians over whom they rule. Of course, the U.S. is slowly but surely remaking itself into a second (but much more dangerous) Brazil. So perhaps the chart of PBR is a chart of the future for U.S. markets. Except there is more residual optimism about China and it hasn't broken through the 2009 low yet. I agree about PBR and that U.S. is following the Brazil path. Ah, yes, that rare company not run for the benefit of shareholders.